Home / Weight loss & Fitness / How much exercise is recommended daily? Often, adults wonder just how much exercise they should be getting daily. Health.gov, a government website, has put together their Physical Activity Guidelines for Americans, which states that adults should be getting a minimum of two and a half hours of moderate aerobic activity into their schedules each week, or a minimum of one and a quarter hours of vigorous, high intensity aerobic activity each week. Additionally, they suggest this be done over a five day span. This means that healthy adults could simply walk for half an hour each day, or perhaps take a high energy workout class one day and jog for half an hour on another day, and mix it up, in order to get their allotted time in. Those who double the suggested amount of time would lose weight. And, the publication notes that adults should also try to get in strength training exercises on at least two days each week. These muscle conditioning workouts could be done with weights, resistance bands or even body weight, for those who are just starting out. For those who are wondering just exactly how much cardio is enough, those who are new to exercise will want to begin slowly, adding just a few minutes per day. Most personal trainers suggest working up to 40 minutes, 3 to 5 times a day, which is in line with what the government suggests in their above referenced publication. For those looking to lose weight, predominantly body fat, 40 minutes of steady state (moderate) cardio, like a brisk walk, a bike ride or even a jog, will do the trick. However, exercisers who wish to up the intensity, can cut their workout times in half and still lose weight and body fat. 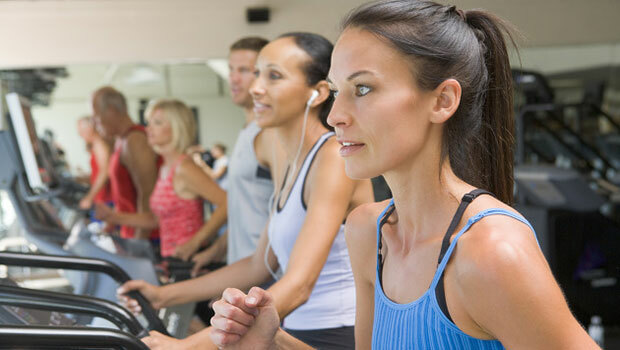 For higher intensity work, a spin class is a great option, a run, or even an interval training session or class at the gym. In a High Intensity Interval Training class, typically known as a HiiT workout, exercisers will work hard for 30 seconds, and then rest for 20, and repeat. This really revs up the metabolism and increases calorie burn, even after the workout is complete. For those looking to lose weight, longer cardio sessions will not really do you any more good than a 40 minute session, because when the body exercises for long periods of time, like an hour or two, it starts to slow down the calorie burn and begins to use stored muscle for energy, which is detrimental to losing weight. Stick with 40 minutes to really see the benefits. Even for those who are not looking to lose weight, getting 40 minutes of moderate cardiovascular exercise into their schedules 3 to 5 times a week will also keep the heart healthy. Exercise, especially consistent exercise, will help to reduce the body’s risk of heart disease. It will also reduce the risk of some types of cancer and stroke. Exercise helps the heart because cardiovascular training increases the efficiency of blood circulation in the body. This helps to get more nutrients to the entire body, and it helps reduce blood pressure. Since adults need to exercise nearly every day, it is important to find activities that you love, or at least like, otherwise you won’t exercise. Exercise is a very personal choice, and there is no one right activity for every person. Do what you enjoy, and you will keep doing it! Those who hate to run, should not do it. Perhaps you like to bike? Grab your bike and head for a trail, or take an indoor cycling class. Love to dance? Try a class that allows you do just that. There really is something for every single person! See also: Can Yoga Help With Weight Loss? Remember that the government guidelines also suggest weight training twice a week. Conditioning the muscles, and strengthening them, is so important, especially as adults age. Every decade, the body loses muscle, unless the body is conditioned. Cardio exercise helps burn fat and helps the body lose weight, but it does not help the body build muscle. For that, you need to pick up dumbbells, a barbell, or even resistance band. Try for two muscle conditioning workouts a week; one for upper body, and one for lower body. If you are a member of a gym, you can simply use their machines to work your body. Or, use free weights. Either is a good choice. Just make sure not to lift too heavy, or too light. Challenge the body, but do not hurt it. Older adults who are healthy can follow these same guidelines. However, older adults who feel that they cannot meet these guidelines due to chronic conditions should try to be as physically active possible. However, those with chronic conditions should make sure to talk to their doctor or healthcare provider about what exercises will work best for them. Note that physical activity can actually help to manage chronic conditions.